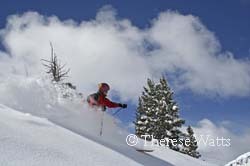 We love skiing Utah and have been skiing there on a regular basis for many years. From a cost perspective, you can stretch your ski dollar further here with a bit of planning. Skiing is easily reached within a couple hours of your arrival, and Salt Lake is a major hub servicing many airlines, so you can often snag a pretty good airfare deal. Once here, you can choose to stay in the city, valley, or on the mountain depending on your time constraints and ski budget. Budget rates are often available, even with short term planning, in the city and valley. The mountains offer first class resort accommodations with attractive rates before the Christmas holidays and just after the New Year well into January. The snow is about as reliable as anywhere we've ever skied, and if you are staying in town or have the opportunity to stop in town, you can purchase discount lift tickets at a number of ski shops or grocers including Canyon Sports and Smith's. If you know you're going to ski well in advance of your trip, you can purchase blocks of tickets for as few as 10 days at reduced prices prior to labor day for some of the resorts. (Check the web-sites of individual resorts in later July to August for details.) In addition, many of the downtown hotels offer nice ski package deals that include lift tickets and UTA (Utah Transit bus/train) transportation. Deer Valley, Park City, The Canyons, Snowbird, Alta, and Snowbasin. Powder Mountain, Solitude, Sundance and Brighton which offer even more variety! Don't discount these resorts, as each has it's own charm. Powder Mountain is an old fashioned resort with some pretty unique ski opportunities. Solitude has made significant improvements over the years and is now a really nice resort with a European look and feel. We find the skiing here to be more appealing to intermediate skiers, although Honeycomb Canyon can be lots of fun and not very crowded for the experts out there. Sundance is an incredibly beautiful area and a nice diversion for a day or two. Brighton is a fun resort with a lot of appeal for Snowboarders and the younger crowd in particular! If you just have to ski them all, and don't have much time...there are guided ski tours available that go between a number of the resorts. Since Salt Lake is a major city, fine dining opportunities abound, and some pretty good deals can be found in the city. So just how do these resorts compare overall? Well, it really depends on what you're looking for, so here's how I would describe each. Lodging in Deer Valley: The choice is enormous, and the lodges are all beautiful. Fine cuisine is readily available, and you will have no problem finding a special dining experience here. The only problem is that you may easily exhaust your budget. Skiing in Deer Valley: A nice mountain with some fun glade skiing opportunities. The day lodges are very nice. Many of the runs are meticulously groomed, but challenges can still be had for the adventurous. The lift system here however leaves something to be desired. For the price of the lift tickets, the lifts are not up to par. Snowboards are prohibited. Lodging in Park City: Lots of different lodging opportunities in a variety of price categories. This is a good size ski town with many hotels and condominiums available. Likewise there is a large variety of restaurants and bars, and a variety of shops to walk about in town. This is a good place to bring your family if not everyone really wants to ski, as there are other things to do. Lodging in The Canyons: A nice large time-share unit was recently built at the foot of the hill. It is very elegant, and no doubt a nice place to stay. You can however easily stay anywhere in Park City and still ski The Canyons. Skiing The Canyons: Good skiing for all levels. Lots of improvements have been made to the lift systems. Skiing opportunities similar to that of neighboring Park City. Alta - A throwback in time. Lodging in Alta: Think of the ski resorts you've seen in old films. The rooms are generally small with shared common areas. Breakfast and dinner are often part of the lodging package, and you will likely be seated with other guests. There is often some evening activity available like a ski film. You'll be treated like part of the family. You may even find yourself hooking up with other guests to ski for the day. Skiing in Alta: Alta has the reputation of never changing, but this is not entirely true. Many aspects of Alta have improved over the years, and in recent times they have built two very nice modern day lodges on the hill. You can even have a full service lunch mid-mountain (think service, tablecloths, and china). 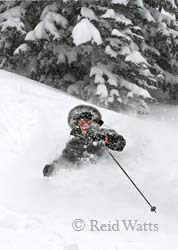 Alta has great skiing and generally satisfies all levels of skiers. It once was a bit difficult to find the best slopes, as you kind of had to know where to go, but the signage in Alta has improved significantly over time. There are some runs that require a bit of walking or traversing to access, but they are worth it! Alta is for skiers....i.e. no Snowboarding allowed. Lodging in Snowbird: Buildings are all poured concrete. Nice comfortable hotel rooms, studio apartment units, and condo suites are all available on the hill. Many of the rooms have beautiful views of the ski hill. There is a nice variety of restaurants, at least enough to keep you busy for a week. There is usually some evening activity planned within snowbird like a film or lecture. Pick up the snowbird daily newsletter to find out "what's up at the bird". Otherwise, it's pretty quiet at night. Okay... in all fairness Snowbird does make an effort to have some sort of musical entertainment with some good apres ski music on the plaza...but still it's pretty quiet. This however is a good thing, as you should be pretty tired if you really skied all day! There is a sports bar below the tram that younger folks like to frequent. Skiing in Snowbird: Snowbird has made significant improvements to their lift systems and opened a good deal of new terrain in recent years. Some of the terrain requires hiking or traversing to access, so you need to watch for the marked gates. However be aware that many skiers find Snowbird a bit intimidating. With this said let me make it clear that Snowbird has a variety of skiing available to suit all levels of skiers, including some really good intermediate runs. Snowbird offers a tour of the mountain to new guests daily, and has many ski hosts/hostesses available to help guests find their way around...so be sure to take advantages of this service if you feel the need. If you're beyond this, then just get out, up, explore, and enjoy! This is a big mountain with lots of hidden treasures waiting for you to find them. Lift Passes: You can purchase a ski pass that combines Alta/Snowbird, however this pass costs more than purchasing a ski day at either of the resorts. It makes sense if you have only one day to ski and want to see both, or you just love having all that choice and don't mind the extra cost. The gated cross-over is easy to ski, However, each of these resorts has enough terrain to easily keep you on the move all day...so don't concern yourself about lack of variety or boredom! In fact, you will need to visit many times if you wish to find all the terrain these areas have to offer. Also be aware that the UTA bus is available for transport between these two areas, so you can stay at either resort and ski the other for a day! Lodging in Solitude: In recent years, Solitude has built and developed into a nice modern resort. You can stay at the lodge right on the mountain. Solitude has a relaxing classy atmosphere. Skiing in Solitude: Good comfortable skiing especially for the intermediate skier. Honeycomb Canyon in particular offers challenges to advanced skiers, and is not crowded allowing the snow to remain good even days after the last dump. Lodging in Brighton: I don't recall this being an option, but you can stay in Solitude and easily access Brighton. Skiing in Brighton: Good lifts, but I'm getting a little old for the usual crowd. This is a good mountain, but it's pretty popular with the younger skier...and they're usually on boards. Anyway, the mountain is good, and if you get a good deal...by all means try it....or you're young and like to board...you'll likely find a good time here! Lodging in Snowbasin: Well, maybe sometime soon...or so we've been told the last couple of years. Until then, drive from the Salt Lake Area for the day, or stay in Ogden or one of the nearby small towns of the Ogden Valley region. Skiing Snowbasin: This was the site of the Year 2000 Olympic Downhill. The infrastructure improvements made prior to the Olympics are astounding. The day lodges are gorgeous and the lifts are modern and comfortable. The skiing is great as are the views. If the weather if nice, you will have great views of the Great Salt Lake and the whole of the Ogden Valley. Skiing opportunities abound for all levels of skiers. Lodging for Powder: I'm skipping over this as I don't have much to say on this topic and it's unlikely you're traveling just to come spend your entire vacation at Powder Mountain. Skiing Powder Mountain. It has be feeling of "the old local ski hang-out". It's friendly and unrestricted. Some people even bring their grills and tail-gate at lunch in the upper parking area. You can't help but feel relaxed here. The skiing can be quite an experience, with the lift transportation...well just a bit different. Several of the advanced runs end up at the road where you catch the resort bus to take you back up (look for the gates to enter powder country). Powder often has good snow after the other areas have been chopped up. We certainly enjoy it! Lodging in Sundance: Lodging is available but I don't have experience staying here and once again I think it's unlikely you're traveling just to ski Sundance. However, Sundance is easily accessible if you're staying in Provo. Skiing in Sundance: This can be a nice diversion especially on a good sunny day. The surrounding area is just beautiful and the day lodge at the top offers a nice sun porch where you can lounge around and enjoy the view. The lift ticket prices are reasonable, especially mid-week. Daily guided mountain orientation tours are offered which are friendly and informative. Wherever you choose to ski in Utah, it is sure to be an adventure. Hope to see you on the slopes! p.s. This note is for those of you who occasionally enjoy relaxing with ski mates over a cocktail after a great day on the slopes. Over time, many of the once unique Utah liquor laws have become more relaxed, but Utah may now be reverting to their past. Legislation passed in 2011, (HB312) will prohibit many of the daily drink deals that have been made available in recent years. (Utah already does not allow happy hour specials.) The concept of drink deals is expected to vanish starting with the 2011/2012 ski season..
Photographs available on canvas or aluminum by special order. Call for details.